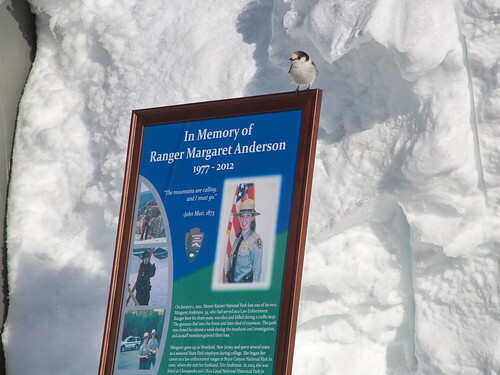 Remembering Ranger Margaret Anderson, a photo by The Bacher Family on Flickr. A photo panorama on the occasion commemorating the death of Ranger Margaret Anderson on January 1, 2012, in Mount Rainier National Park. Ranger Anderson was shot by a gunman trying to reach the busy parking lot at Paradise, where over a hundred visitors were enjoying a beautiful Sunday morning. Margaret had blocked the road with her car. The gunman fled into the snowy forest and died of hypothermia; his car was filled with weapons and ammunition. Margaret left behind a husband and two very young daughters, and a lot of people who believe that her sacrifice prevented a much larger massacre. Mount Rainier National Park Rangers, and some members of the public who had been at Paradise during the incident, celebrated Margaret's memory on January 1, 2013 with a private ceremony, followed by a public flag raising, pictured here, at the Paradise Ranger Station.